Today's VetGirl guest blog is by Dr. Raegan J. Wells, DVM, MS, DACVECC, an Assistant Professor of Emergency and Critical Care Medicine at Colorado State University. She's a venomous rattlesnake guru! The following is a brief overview of current antivenom treatments for veterinary patients.  North American Coral Snake Anivenin (NACSA) is concentrated, lyophilized antivenom consisting of whole IgG molecules from horses that have been immunized with eastern coral snake venom. Wyeth Pharmaceuticals initially manufactured this antivenom, which is now a part of Pfizer. This antivenom is no longer being manufactured in the United States, and all existing vials (Lot 4030026) were labeled to expire as of October 31, 2012. This antivenom is the only available coral snake antivenom approved for use in humans by the FDA in the United States and is under very close monitoring. As such, it is only available for human administration.  Coralmyn® is a relatively new antivenom manufactured in Mexico that is a concentrated, lyophilized antivenom consisting of F(ab’)2 fragments of polyclonal antibodies from horses that have been immunized with black banded coral snake venom. This antivenom has been shown to be effective at neutralizing eastern coral snake and Texas coral snake venom in a mouse model. The USDA is the government organization that monitors and approves use of biologics for veterinary administration. This antivenom is available for use in veterinary medicine with a USDA import permit pending USDA or FDA (human) approval.  Antivenom Crotalidae Polyvalent (ACP) is concentrated, lyophilized antivenom consisting of whole IgG molecules from horses that have been immunized with venom from the eastern diamondback, western diamondback, tropical rattlesnake and fer-de-lance snakes. This antivenom solution contains whole IgG in addition to other proteins in each vial. There has been a failure to reverse the neurologic effects of Mojave rattlesnake venom with this product. Literature does exist describing the use of ACP in dogs, cats, horses and camelids for pit viper envenoming. Acute and delayed reactions have been documented with this product. The whole IgG antivenoms are not cleared as rapidly from the circulation as some of the newer fragmented formulations. The time to reconstitute this antivenom can be prolonged and averages one hour in human studies. ACP antivenom is distributed by Boeringer Ingelheim Vetmedica and is currently the only USDA approved antivenom for use in veterinary medicine. Depending on the distributor, a veterinary clinician may be able to purchase this antivenom for about $300.00 - $500.00 per vial.  F(ab) antivenom (CroFab®) is a concentrated, lyophilized, purified polyvalent antivenom consisting of F(ab) fragments from sheep that have been immunized against the eastern diamondback, western diamondback, mojave and cottonmouth. The whole immunoglobulin molecules are enzymatically cleaved, leaving only monomers of antigen binding fragments. This antivenom is rapidly reconstituted (<10 minutes) and has been shown to be about 5 times more potent at neutralizing various pit viper venoms in animal models than the ACP product. It is a small molecule and thus is rapidly cleared from circulation. The clinical syndrome of re-envenomation has been appreciated in humans and often necessitates multiple vials for a single envenomation. The cost per vial billed to insurance companies is as much as $30,000.00. 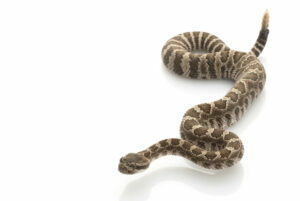 Depending on the distributor, a veterinary clinician may be able to purchase this antivenom for about $1000.00 per vial. One prospective clinical trial evaluating this antivenom in dogs reported that 1.25 vials per dog were administered on average.  F(ab’)2 antivenom is a concentrated, lyophilized, purified polyvalent antivenom consisting of F(ab’)2 fragments from horses that have been immunized against the tropical rattlesnake and the fer-de-lance. The whole immunoglobulin molecules are enzymatically cleaved, effectively removing the Fc portion of molecule and leaving the two antigen neutralizing sites. While it is a smaller molecule than the whole IgG, it is not as small as the F(ab) monomer. A retrospective analysis of 180 dogs treated with this antivenom in Arizona found that 1 vial was sufficient to improve clinical signs in most patients. This antivenom has shown efficacy in resolving both neurologic and myotoxic effects of rattlesnake envenoming in dogs. An experimental safety trial in healthy dogs demonstrated no acute or delayed reactions when up to 6 vials were administered over one hour. Veterinary literature exists describing the use of this antivenom in veterinary patients treated for rattlesnake envenomation. This antivenom may be available for purchase from Mexico (Veteria Laboratories) with a USDA import permit pending USDA approval. The average cost per vial for veterinary purchase is $300.00. Other F(ab’)2 products from Brazil and Venezuela are available, however there is no current published peer reviewed veterinary literature on these products. Stay tuned for future veterinary studies, as clinical trials are underway.  Lastly, there is an unpurified equine plasma protein product called RTLR (MG Biologics). These are doses of equine plasma from horses that have been vaccinated against the Mojave, eastern diamondback, western diamondback and prairie rattlesnake. The manufacturer recommends administration at 4mL/kg. Each bag has 100mL of unpurified equine plasma. Peer review literature evaluating safety or efficacy does not exist at this time. The label reports that of six dogs that received the product for an in house trial, all experienced mild to moderate allergic skin reactions around the injection site in addition to peripheral lymphadenopathy 48 hours after infusion. The author cautions against offering this therapy to canine and feline patients in lieu of purified antivenom products. Potential complications include volume overload due to relatively larger dose of colloid product compared to antivenom and risk of acute and delayed hypersensitivity reactions. It is recommended that this product be reserved for equine patients only until further studies have been published. Dart RC, McNally J. Efficacy, safety and use of snake antivenoms in the United States. Ann Emerg Med 2001:37(2) 181-8. Woods C, Young D. Clinical safety evaluation of F(ab’)2 antivenom administration in dogs. JVECC 2011:21(5) 565-9. Kasturiratne A, et al. Estimation of global burden of snakebite.2008.World Health Organization. Wells R, C Woods. F(ab)2 antivenom treatment: a retrospective analysis of 180 rattlesnake envenomations in dogs. Abstract. IVECCS 2013. Trying to confirm that a new canine antivenom product, Venom Vet, is 1)effective against Southern Pacific rattlesnake bites WITH neurotoxin and 2) that it is USDA approved now. Thanks. Getting conflicting and incomplete information from various sources. We’ve never used the product Venom Vet, so would recommend checking directly with the company – it is labeled for use for crotalid venoms.